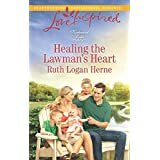 Ruth Logan Herne’s Healing the Lawman’s Heart is, as all of her books are, a book you are sure to enjoy. The lawman, Tanner Reddington, comes into the story with some heavy-duty baggage. And the heroine, Julia Harrison, has her own set of problems. Yet, there is a strong attraction between the two which, of course, grows as the story progresses. I won’t give away the problems, or the ending, so that you must read the book to find out what happens. This is one book you definitely want to add to your “to be read” stack!